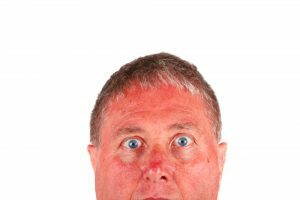 Sunburn: What Can Be Done? Sunburn can be prevented and relieved! Sunburn is a real issue in the season of Northern latitudes! Everyone does what they can to avoid the pain. However, it helps to have valid information rather than having to rely on commercial advertising! Of course, sunburn comes from too much time in the sun. People get fooled because it doesn’t show up fully until 4 or 6 hours after the minimum burning time is past. So those of you who think you can hang out unprotected until you feel signs of burning are going to be very surprised later on! Ultraviolet light causes damage to cells and triggers production of prostaglandins and cytokines, which are inflammatory proteins responsible for causing redness, swelling, and pain. It takes some time to create these proteins, so it is not smart to simply stay in the sun until you feel the burn! UV-A is the longest wavelength and penetrates deepest into the skin, causing age spots and wrinkles, but not significant burning. It can penetrate the ozone layer high in the sky and glass. Not a danger of burning, but it does accelerate the appearance of aging. UV-B is the primary cause of sunburn. It is partially blocked by the ozone layer and is completely blocked by glass. This is why people who drive with their window open for a long distance may get burned only on their left arm — well, at least in the US; in UK, this might happen on the right arm, except sun is relatively rare! UV-C is the shortest wavelength and is completely blocked by the ozone layer, hence not a factor for sunburn. Titanium dioxide and Zinc oxide are metals that reflect and disperse UV light. Historically it used to be a white paste; nowadays, micronizing technology renders them transparent yet still effective. Thus, white noses are a thing of the past. In addition, a variety of organic chemicals absorb some UV and transform energy into heat. Some sunscreens are water-resistant which enables you to swim and sweat. However, it is generally recommended that you re-apply sunscreen every couple of hours just in case. SPF scoring represents a multiplication factor on top of your minimum base time for burning. At the peak of summer at mid-day for a Caucasian with sensitive skin (say, an Irish redhead), this might be 15 minutes. SPF 30 would equal 30 x 15 min/60 min per hr = 7.5 hours. Darker skinned people have a longer minimum base time. The only way to know this number with accuracy is to test it out on yourself — maybe just on a small area of your extremities. SPF 30 blocks 96% of UV light. Higher SPF than this protects in minimal amounts: SPF 90 adds only 3% more. If you are a farmer or lifeguard, this might be valuable over a span of years, but for the average tourist it wouldn’t matter. By the way, the FDA recommends SPF 50 for some reason. One common myth is that there is no need for sunscreen during an overcast — FALSE! Overcast only blocks up to 20% of UV-B! Another important factor to take into account is reflected sunlight from sand or water or snow; reflection can account for 70% of exposure. Sunburn from skiing comes from the surroundings plus the altitude (where there is less atmospheric blockage of UV-B. Time magazine wrote an article in 2015 that quoted important research on the quality of sunscreen. A first point is that only 14% of men use sunscreen at all, and only 30% of women. So most people are flirting with sunburn when they are outdoors. Of course, this does not measure those who religiously stay indoors or covered up for fear of getting skin cancer — a paradox, because some level of tan is important to get biologically active Vitamin D, which helps prevent cancer! The Environmental Working Group evaluated 1700 products and found that 80% were inferior or had potentially harmful ingredients. The main such ingredients included oxybenzone which disrupts systemic hormones, and Vitamin A which increases sun sensitivity when applied to the skin (not when taken internally). Of all the products, Neutrogena was the leading offender. The EWG named names of products and ranked them; you can look up your favorite at https://www.ewg.org/sunscreen/. What to Do Once You have a Sunburn? Mild: light redness with itching, tightness, perhaps a little stinging. Moderate: redness, swelling, blistering, and strong stinging or burning pain. Severe: damaged tissue with blistering, blackening of skin, cracking or sloughing of skin. Severe damage probably needs medical care. Breaks in the skin increases the chance of infection, so sterile gauze (perhaps soaked with silver nitrate or other antiseptic) might be required. In moderate sunburn, do not break the blisters. The skin cover prevents infection. With mild sunburn, you may want to apply Aloe vera directly from a plant or gel. Urtica urens gel or Hypericum gel are good also. Instead of gels, you can apply dilute tinctures (20 drops into one liter = 2 pints of water) of Urtica urens, Hypericum, or Calendula. As the skin heals a bit, damaged skin will begin to flake off. Applying some oil just as this begins will help minimize flaking. Vitamin E oil, fish oil, cocoanut oil — all are good. There is no specific module for sunburn on MDinyourHand.com, but you can play the MP3 eRemedy DIRECTLY on your cellphone or computer to get rapid relief for sunburn. Normally, acute ailments require a high degree of individualization by having you answer some questions in order for the expert system to find an appropriate eRemedy. For sunburn, though, there are some fairly routine eRemedies that work very well! Choose which one to use, then play it every 15 min for 4 times, then reduce the pace as discomfort subsides. Overall, you should not do more than 20 doses because there is a small chance of it making discomfort worse after that.